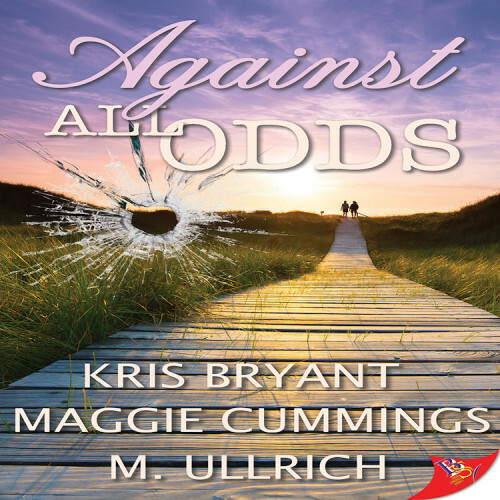 October is upon us and with it comes the release of Against All Odds, a collaborative novel between Kris Bryant, Maggie Cummings, and M. Ullrich. Planning and writing this book took us over a year, and now it feels like ages ago. As the authors, we wanted release month to be a truly special occasion, so we got together to interview three very important people, the stars of Against All Odds: Peyton Clarke, Tory Stevens, and Bradley Richter. Authors:It’s great to have you all together again. Tory Stevens:I can’t believe release month is here already. Authors:How does it feel, knowing that your story is just now becoming available for public consumption? TS:Oddly, not all that different. I feel like we’ve been in the public eye from day one. PC:But it’s a little different now, no? For everyone to see the details? Even the private ones. TS:I didn’t even think of that. Bradley Richter:I, for one, am excited. I want the public to know my side of the story. The synopsis of this story is slanderous, to say the least. PC:The synopsis is all fact. How is any of that even remotely slanderous? BR:Settle down. I’m not denying the truth of anything stated in the synopsis. But the summary is grossly oversimplified. I’m not given any credit for the good that came from my actions. TS:You want credit…for what exactly? You’re lucky to even be included in this interview. After what you did, you’re dead to me. Authors:Let’s keep it friendly, everyone. This is an opportunity to give people a chance to get to know each of you a little and form their own opinions. Now, to give people a little insight, why don’t you tell us a little bit about yourselves. PC:I’m Peyton Alyssa Clarke. I’m twenty-eight, born and raised in Tinton Falls, New Jersey. I followed my dad’s footsteps and joined the Tinton Falls Police Department as soon as I was eligible. It was the best decision I ever made—I absolutely love my job. If I’m not working, chances are I’m at the beach. Living so close to the Jersey Shore, I’m fortunate to be surrounded by awesome beaches and I take full advantage. I just love it there. TS:I’m Tory Michelle Stevens. I’ve been in the real estate business for about ten years. I love pairing families with the perfect house for them. I have a bossy cat, or rather he has me, named Jager. I enjoy going to the beach, reading, binge-watching Netflix, and chocolate. PC:You really do enjoy the beach, too. Like, you couldn’t possibly be more perfect. BR:The beach is nothing more than a magnet for tourists and their garbage. Authors:Okay then. What about first impressions of each other? PC:Oh my God, Tory was so sweet to me right away. She didn’t know me from Adam and was instantly so caring and thoughtful. I also thought she was absolutely gorgeous. I about fell over. Authors:Tory, we can feel you blushing from here. PC:It’s the absolute truth. She knocked me off my feet. TS:I thought Peyton looked so beautiful on that pedestal. I gravitated toward her because I wanted to get to know her. I knew I had to meet her. She said she was hungover, but I only saw perfection. PC:Stop it. You’re too much. TS:I’m speaking from my heart. Authors:Moving on…Peyton mentioned being born and raised in New Jersey, but what about you two? Tory and Brad? Authors:Sorry. Tory and Bradley, tell us about your upbringing. TS:When I was growing up, my mom and I moved around a lot wherever she could find work, but I grew up mostly in the Northeast. Red Bank feels like home to me. I’ve lived here the longest. BR:Home? A home is just a place that offers a false sense of security. Something that could be taken away at any moment by the ones you love the most. PC:Only you would see it that way. Home is being around people you love, who care about you. Whether you’re lucky enough to find that in your given family or your chosen one, it’s just about being accepted and valued for who you are. Authors:It’s safe to say the three of you are all so different, but you shared this one unbelievable journey. What about yourselves carried you through and what have you learned along the way? BR:Deep down I’ve always known I was destined for greater things, and when I saw the opportunity to help and guide someone I love, nothing could stop me from doing so. PC:One of the things my parents instilled in me was to always find the best in people. My dad always said, “If you spend enough time with someone, you will see the good in them.” It’s hard to apply that to Bradley, but he played a part in bringing me and Tory together. I’ll never thank him, but I will honor my relationship with Tory. I will always respect it and never take our lives for granted. For myself, for this amazing woman, and for those women who lost their lives that day. TS:I’ve always prided myself on being a strong, independent woman, so I think my ability to make quick decisions and go with my instincts helped cultivate the relationships in my life, especially during this experience. PC:I, for one, am elated that you never doubt your instincts. TS:And since then, I’ve learned to open my heart more and just follow the butterflies, and by doing so, I found the love of my life. PC:Professionally, I’ve learned that you can never be too prepared. Personally, I’ve learned that finding real love has a healing power like nothing else I’ve ever experienced in my life. BR:And you refuse to thank me for that. You delude yourself into believing these things but don’t give proper credit. How ungrateful. PC:I am very grateful for what I have, but I owe you none of that. Authors:Does that mean you have learned something from the experience, Bradley? BR:I can’t say I’ve learned much, except that my planning skills could’ve been better. Authors:And that’s our cue to wrap things up here. What message are you hoping the readers take away from your story? BR:People will hurt you, but don’t give up on them. Sometimes their betrayal is an opportunity to take control and help guide them down the proper path. TS:That you can find love anywhere. When you least expect it. That good still wins. That when things seem hopeless, life has a way of shining through and finding its way inside your heart. Don’t give up. On life, on love, or on yourself. PC:My takeaway is all about love and life. How it’s valuable and vulnerable and there are absolutely no guarantees. Every day is a gift. And even when awful things happen, love still prevails. I learned that firsthand. I’m sharing my story because my hope is that someone might read it and, in their darkest hour, remember that even in the worst circumstances, light will still shine through. Authors:What a beautiful note to end on. Thank you all so much for joining us today. We know your story has changed us for the better, and readers will have the opportunity to experience it for themselves very soon. TS:Thank you for having us. PC:Revisiting the story like this has been fun! We should really be thanking you all for bringing us together in the first place. Authors:Trust us, the pleasure was all ours.